I don't believe I had been on a bike since I moved back to Connecticut from California back in the late 80's but it turned out that it was extremely easy to remember how to do, though dodging other bicyclists and pedestrians who obviously didn't care that you might run them over if they walked in your path was a little tricky at times! I got real good at hitting the brakes very quickly and luckily never managed to fall over, which would have been uber embarrassing! Naturally there was a lot of stopping for pictures and looking at the map I had as I had absolutely no clue where in the park we were a couple of times and the signage could have been a little better but for the most part we covered all of the sights that I thought would be nice to see and a few I hadn't! 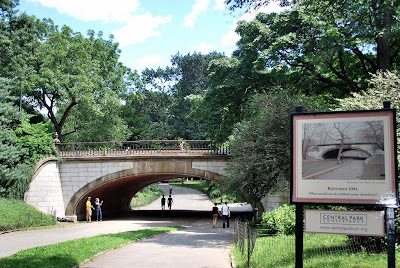 I've spent a little bit of time in Central Park in the past but this trip was the longest amount of time I'd been there and I really wanted Jamie and I to have a chance to see some of the highlights of the country's oldest public park. Just a brief bit of history (as I'm sure you knew there would be!) - the park currently covers 843 acres but was originally built on 700 acres of swamp and desolate landscape in 1857 as a way to show Europeans that we Americans weren't totally without class and cultural refinement! The land itself was chosen because of its lack of appeal for commercial building and eminent domain did the rest evicting approximately 1,600 people who had made their home in the rocky terrain. The park was based on the winning design of Frederick Law Olmsted, the park superintendent, and Calvert Vaux, an architect, that was called the "Greensward Plan". It took more than ten years, ten million dollars, and approximately twenty-thousand Irish, German, and New England-area laborers who toiled ten-hours a day for $1.00 to $1.50 per day to create Central Park. The first part of the park was opened in the winter of 1858 and construction of the park was finally completed in 1863. 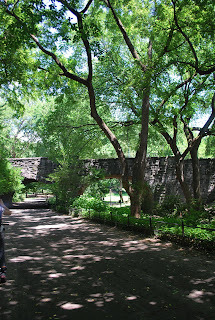 The park's maintenance and beauty declined a bit in the 1960's and 1970's due to severe budget cuts within the city so the Central Park Conservancy was formed which - to this day - contributes more than half the public park's budget and exercises substantial influence on decisions about its future and maintaining the beauty that can be found in the heart of Gotham. 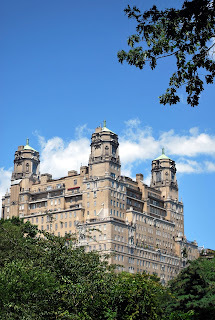 Some of the really beautiful things we saw weren't just inside the confines of Central Park however but could be found towering over it, like this building here which is named The Beresford and has been home to many of the rich and famous of New York City. The building was designed by Emery Roth, who also designed the San Remo which is another of New York's most prestigious residential buildings, and even though it's only 22 stories tall it looks a lot bigger as you're staring up at it! With two bedroom apartments starting at just under $3 million, I don't think I'll be moving there anytime soon so I'm just going to have imagine what the view of Central Park looks like from there. Darn, I really do need to find that winning Powerball ticket! 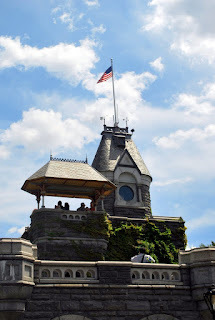 While on the subject of castle-like structures, one of the things I had really wanted to see was Belvedere Castle which sits atop Vista Rock, the second highest natural elevation in the park. The castle was built in 1869 using Manhattan schist (a type of metamorphic rock) that was excavated from elsewhere in the park and then dressed up a bit with gray granite. The views from the castle are absolutely phenomenal so it's well worth the steps you have to climb to get up there! 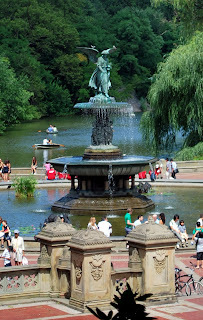 Another "had to see" was Bethesda Fountain which sits at pretty much the center of Central Park. The sculpture that tops it, Angel of Waters, was designed by Emma Stebbins in 1873 and is one of the most recognizable icons in the entire park. The angel holds a lily which symbolizes purity as the sculpture was designed to celebrate the new Croton Aqueduct that not only fed the fountain but also supplied fresh/pure water to New York City. Considering the contaminated water they had before, the new aqueduct gave the citizens of New York plenty of reason to celebrate! Personally I kept wanting to break out into a rousing chorus of "That's How You Know" from Disney's musical Enchanted but I managed to restrain myself and not embarrass the heck out of Jamie! Nor did I try to reenact any scenes from Godspell and act like I was John the Baptist singing Prepare Ye the Way of the Lord which really would have mortified Jamie! Aren't I a good Mom?!? Because it was an absolutely beautiful day it looked like a good part of the population of New York City was out in the park enjoying the gorgeous weather, many of them with their pets along for the adventure. Jamie decided to keep count of how many she saw during the time we were there with a final tally of 105 dogs and 1 cat on a leash! After our 3-hour trek through Central Park, we returned our bikes, hopped on the nearest subway, and made our way over to Bryant Park where there was supposed to be a Crumbs and delicious cupcakes therein but we looked all over the place and couldn't find one anywhere. Leave it to New York to be constantly moving things around! We finally gave up and made our way down towards Time Square where I took Jamie to the Hard Rock Cafe for a late lunch/early dinner in order to have some sort of strength for the next part of our agenda - a walk across the Brooklyn Bridge! While I'm still putting the pictures together for that one, I'll leave you with a video that I made with some of the pictures from our time in Central Park. Wow! That was completely AWESOME! 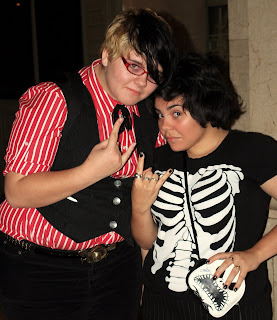 You really are a cool Mom! Someone needs to hire you to be a Travel Photo Writer Journalist! Thanks for taking us along. Getting back to the bike is dicey at first, but within five minutes it becomes second-nature. Thanks for the great tour! A cousin of mine and his wife and family are currently in Europe on some kind of missionary tour/work there and she has posted a slew of pictures of their adventures on Facebook, plus a couple other bloggers from all over the world keep posting pics of their neck of the woods and then, you add to this with your pics of the little trips you take, all of which add up to my being able to see the world right from the middle of my living room! Ain't technology just grand though to enable us to do things like that? I have so go to see this for myself but until then I enjoyed my tour courtesy of you! Ha ha ha you're so funny! I'm glad you didn't fall over too. I know I would have-I really admire you and Lois both for getting back on bikes. Not sure I'm as brave. I just had Godspell in my head the other day. How strange you mention it here. How fun Linda. I'm glad you two had a great time. Bike riding and all. Beats walking in a park that huge. There were lots of bridges in the part I noticed. Great video. A great tour, Linda, I've seen those sights in many films. You don't do anything half way! This is a first rate post, and I thoroughly enjoyed "our" trip through Central Park! It all looked so serene and quiet, although I imagine it might not have been too quiet. BTW: I loved the music on the video. Great day in the park... and fantastic video! 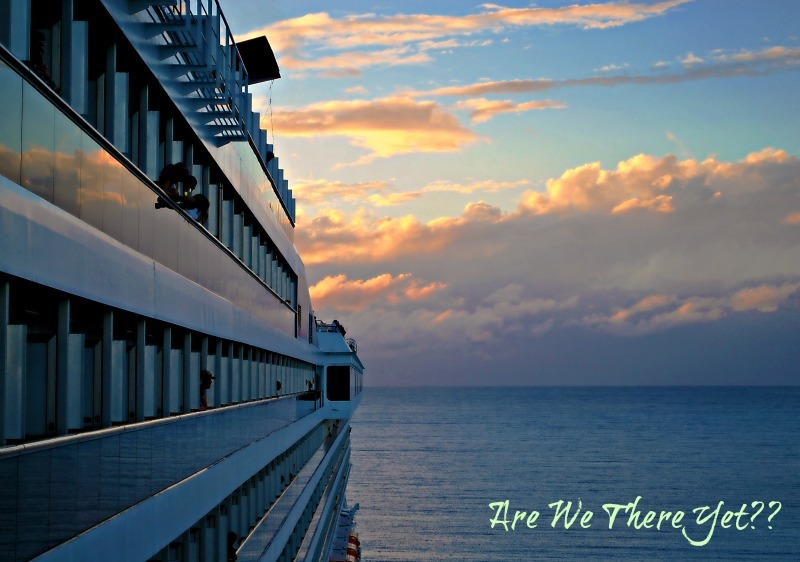 Thanks for taking us along. I didn't realize there was that much to see in Central Park. I thought it was, well, just a park.